The core focus of The Masters’ Way program of self-mastery that we teach around the world assists students to become self-aware. 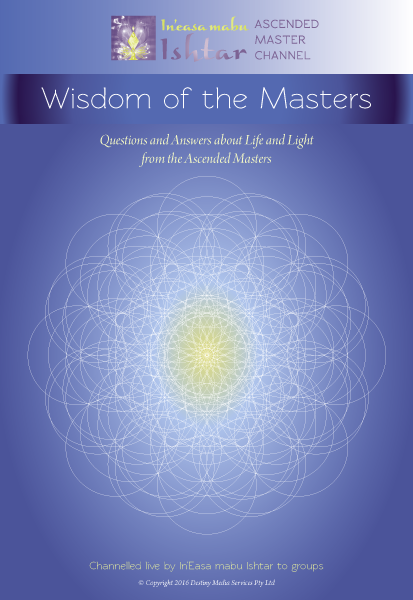 The Masters remind us that we are made up of energy. Every being is an energetic being, no matter how much we are attached to the density of the physical world, we are still energetic in our being. Every cell and molecule of our body and our being is made up of light, which is energy. All light is energy that holds intention. This intention will either be coherent light and aligned to positive potential or incoherent and aligned to distortion and illusion. The energy of our light is always in constant movement, flux and change. Every part of us has its own optimal vibration, yet it will move at certain rates of vibration depending on what consciousness of intention this energy is holding at any time. This consciousness affects the movement of our energy on all levels. Where does this consciousness come from? It comes from the choices we make. It is about what we are choosing to be attached to and hold onto in each moment. We create this consciousness within us and therefore we are responsible for how it affects us. This is why the Masters ask us to become self-aware. They ask us to become aware of what we are creating in our light and to take responsibility for it within ourselves. One of the most important things in self mastery is to become self aware. Yet, how do we do this? There are many ways to become self aware but the first step is for each of us to make a decision to do this and agree to open our heart and minds to ourselves – all that we are. This, of course, may be the hardest decision we may ever make because it asks us to be honest with ourselves and to become the objective observer of ourselves. This can be challenging in our daily lives. But once we make this decision we take the first step onto the path of liberty, because this choice truly sets us free to be all that we may be. One of the ways the Masters suggest to become self-aware is to check in every few days with your rate of energetic vibration. Here is a simple little exercise they ask me to do and I wish to share it with you. When you go into meditation take the time to slow down your breathing, release your thought forms and relax the body. When you do this you will begin to drop into a state of Theta brain wave activity in your brain and it is in this state you need to be in your meditations. When you are truly relaxed, breathing deeply and free from all thought forms, begin to activate and open your chakras one by one starting with the crown chakra. The Masters say that when you do this, check in with each chakra and tune into the vibration or rate of energy they are holding. How do they feel? Are they open and activated or sluggish, do they feel blocked or even closed with no energy flowing through them? Become aware of the rate of vibration that each chakra is holding at the time. Be aware that the vibration of your chakras change regularly depending on what consciousness (intention) you are choosing to hold and what you are doing and feeling. For example, begin with your crown chakra and connect to it and then tune into the vibration of its energy. How does it feel? Does it feel expanded and alive? Does it feel open and ready to receive? Does it feel closed in any way? What does the energy of this chakra feel like to you? Become the observer. When it is open and vibrant then it is ready to receive energy from Source and it will be filled with lots of light energy that will be shared with all the parts of you. If it feels like it is flowing and open then simply call on the light of Source to fill this chakra and breathe it in deeply at least 3-5 times. Breathe in the light of Source with the 'in' breath and with the 'out' breath send this light out all around this chakra. Then continue to move down the chakra column and do the same with all your chakras. If you feel the energy of a chakra is not flowing or is blocked you will need to tune into what consciousness (intention) the chakra is holding and work with it before sending Source light into this consciousness to assist it to realign with its highest potential. For example, today I went to my third eye and all was flowing and expanded. But some part of the vibration was tight and not flowing. So I went into it a little more and was shown the energy that was sitting in the Ajna chakra (between my eyebrows) was tight and not flowing. I have been suffering with infected sinus for some time and was shown that the energy of my Ajna is flowing in a slow vibration. The Ajna chakra is all about my will centre and my ability to direct myself and my body. This chakra controls the pituitary gland and my body, as well as the endocrine system. So I was being shown clearly that I need to do some work on this chakra and send pure light for Source to this chakra to realign its vibration, as well as my body. Another example, is the Solar Plexus chakra. The solar plexus chakra affects more organs of your body than any other chakra, particularly your large intestine, stomach, pancreas and liver as well as your lungs. In this chakra I was able to determine that the energy vibration of this chakra was not flowing very well. Most people will notice this if they are being observant because the Solar Plexus is the chakra most affected by what is occurring outside of us and also deeply within us. Often this is unconscious and so it is not easy to see it clearly. When the vibration of this chakra is not clear and flowing then our feelings and emotions are affected and it may also affect the energy of our whole physical system. When I tuned into what I was holding in my Solar Plexus, I discovered a consciousness that I was holding within me that was telling me that I needed to do more. It was not feeling that I was doing enough. I sat with this energy and let it know that it was okay. I told it that there was no need to feel it always had to do more. I then called the light of Source to fill this consciousness that was sitting in this chakra with pure Source light to replenish it and give it more positive and balanced energy. Whatever consciousness (intention) that is sitting in our chakras is often energy that we may choose to project onto others because we do not wish to accept it as our own creation. So we advise you to choose instead to work with this energy and fill it with Source light as much as it is willing to open to receive it. As I moved down the chakras bringing pure light from Source to each chakra, awakening them, opening them and activating them, I continued to check in with each one to see what vibration they were holding. Whenever there is a slowness of energy, a limited flow, or energy that feels blocked I breathed deeply and tuned into what this energy was. This energy holds consciousness and intention and I tuned into what this was. If I am unable to tune into the intention of the consciousness then I simply hold it in loving kindness and ask for the pure light from Source to awaken it to its divine truth and highest potential. Whenever I do this work, I always focus on my Sacral chakra because this is the centre of all creation energy that flows through me. This chakra governs our creative projects in life, but more importantly how we create ourselves in the physical world. It governs what energy we are putting into our own lives – the creation of ourselves in each moment. If there is any blockage in this chakra then it will affect how we are creating ourselves. I work hard on my sacral chakra because when I was in my 20s I had nine surgeries in this one place on my body culminating in a hysterectomy at 24 years, so this chakra was gravely affected. I have worked hard over the years to restore the energy of this chakra that was affected by this surgery. For me, this chakra is easily weakened and regularly needs to be filled with love and light from Source to keep it open and activated. Interestingly enough, the Ajna, Throat, Base, and the Sacral Chakra are very connected and affect each other when they are not aligned. When the Sacral chakra is depleted the creation energy does not flow to the higher chakras and this may affect the mind and the communication areas and, of course, vice versa. Each time you check in with the way your light energy is flowing in your being you become more self-aware. When you do this you are observing what is going on for you and are no longer choosing to believe you are the victim of the world around you. You are choosing to take responsibility for your own light levels and lifting your energetic vibration in all areas that may be depleted or in need of assistance. When you do this, dear hearts, you are truly choosing to live in self-mastery in your life. Blessings on the path of awakening to the light of you.